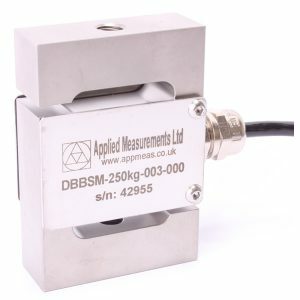 The OBBS bending beam load cell design is suitable for low capacity weighing applications such as batching hoppers where a highly accurate measurement system is required. They are also suitable for use in conveyor weighing applications. The bending beam load cell’s high integrity hermetically sealed IP68 bellows and stainless steel construction means that it is ideal for use in process situations where regular washdowns are required to maintain hygiene standards. Two mounting assemblies are available to suit the OBBS bending beam load cell; the Vessel Mount for static applications and the Shock / Anti-Vibration Mount for mixer, feed hopper and conveyor applications where vibration or transient loads may occur. If you have an existing installation that you would like to upgrade with higher capacity bending beam load cells, we have custom designs for capacities up to 1200kg in the same form factor. Please contact our technical sales team via the form below or by telephone on +44 (0) 1189 817339 for more information.